Settings: Printed on a MakerBot Replicator 2 with no raft and no support on an acrylic build plate, with .3mm layer height. When you load the model the MakerBot Desktop software will tell you that the model needs to be scaled down, but that is only because it needs to be rotated. Rotating by 30 degrees will make the net line up horizontally with the platform. Technical notes, trickiness flavor: The Icosahedron is the trickiest of all the Platonic solids for hinged nets. The one we printed on Day 84 hardly held together; it would collapse at the slightest touch back into its flat configuration. 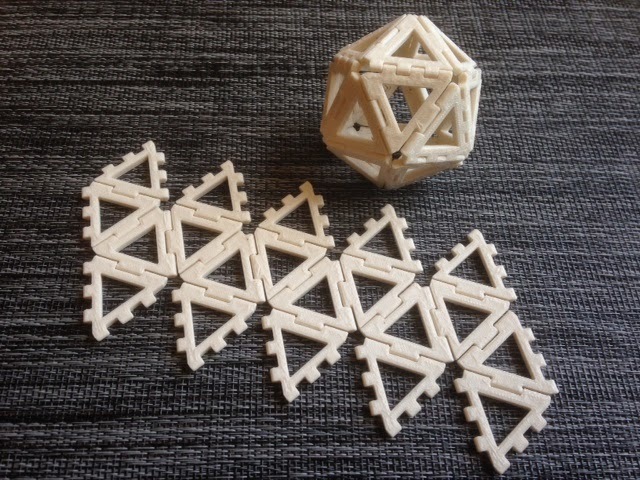 What goes wrong is that the Icosahedron is nearly spherical and therefore its faces meet at very obtuse angles, which makes it difficult to keep the faces snapped together. For this reason we have lowered the clearance between the snaps significantly for today's icosahedron model, reducing it from .55 millimeters to .25 millimeters.